At the onset, and in the immediate aftermath of the revolution in Egypt, it seemed as though every government expert and media commentator, on both the right and the left, was confident that the end result in Egypt would be positive. On the right, there was the unshakeable notion that the Bush doctrine had succeeded; a freedom movement had sprung up in the heart of the Middle East. On the left, there was the equally naive but altogether expected claims that through Facebook and the generic, heroic and youthful “protester,” salvation had come to Egypt. Dr. Timothy Furnish, scholar of Islamic history, in an article entitled “Misunderestimating the Muslim Brotherhood: Media Malfeasance at its Most Malignant,” has done an excellent job of gathering together a handful of such embarrassing predictions. Now that the smoke has cleared, despite all predictions to the contrary, the Muslim Brotherhood has swiftly risen to the highest levels of power in Egypt, and Hillary Clinton has just returned from warmly welcoming them to the table. Let’s take a moment to remember how embarrassingly far off these so-called experts were from recognizing what was coming down the pike. So here we are a mere year later. Where have all of these experts gone? Have they learned their lesson? Sadly, no. Now that the Brotherhood has in fact risen quickly to power, precisely as they claimed would never happen, they have simply adjusted their arguments to claim that the Muslim Brotherhood is not nearly as bad or radical as some of the ignorant right-wingers and fear-mongers would suggest. [In the 1920s, the Egyptians] said: “The constitution is our Quran.” They wanted to show that the constitution is a great thing. But Imam [Hassan] Al-Banna, Allah’s mercy upon him, said to them: “No, the Quran is our constitution.” The Quran was and will continue to be our constitution. The Quran will continue to be our constitution. The Prophet Muhammad is our leader. Jihad is our path. And death for the sake of Allah is our most lofty aspiration. Above all – Allah is our goal. The Shariah, then the Shariah, and finally, the Shariah. This nation will enjoy blessing and revival only through the Islamic Shariah. I take an oath before Allah and before you all that regardless of the actual text [of the constitution] … Allah willing, the text will truly reflect [the Shariah], as will be agreed upon by the Egyptian people, by the Islamic scholars, and by legal and constitutional experts. … Rejoice and rest assured that this people will not accept a text that does not reflect the true meaning of the Islamic Shariah as a text to be implemented and as a platform. The people will not agree to anything else. How is this any different than sitting down with President Ahmadinejad or Osama bin Laden? The lunatics are truly running the asylum. Our country is being led by fools. Its high time that all Americans fall to our knees and ask the Almighty God (of the Bible) to forgive us for our outright complicity with wickedness. Lord have mercy on this nation. Forgive us of our sins, and in the days to come, give us righteous and wise leadership. But instead of standing outside with those who were demonstrating for freedom against a radically repressive ideology, the Secretary of State was inside, having a friendly meeting with that repressive ideology’s foremost Egyptian exponent. It was a telling sign of how quickly America’s international stance has changed during the regime of Barack Obama. 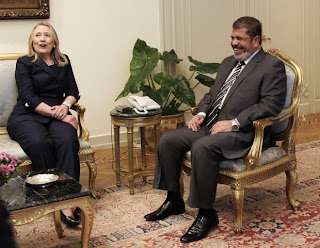 “Things change (at) kind of warp speed,” Clinton enthused to Morsi during their meeting. Indeed. It wasn’t immediately clear whether or not by “delivering results for the people of Egypt,” Clinton was referring to freeing the Blind Sheikh, Omar Abdel Rahman, mastermind of the 1993 World Trade Center bombing and a man who had plotted to murder Americans in the hundreds of thousands. Soon after his election, Morsi announced his determination to work for the Blind Sheikh’s freedom; Clinton was almost certainly far too polite and determined to hew to the rules of realpolitik to rebuke Morsi for this unmistakable insult to the United States. To have done so would have been a completely unexpected reversal of the line the U.S. has taken since the beginning of the “Arab Spring” uprisings that paved the way for the Brotherhood to come to power in Egypt. And so it fell to the handful of protestors outside the U.S. Embassy, rather than to Hillary Clinton, to state the obvious truths: that Egypt under the Muslim Brotherhood regime of Mohamed Morsi will begin to resemble the Islamic Republic of Pakistan, where Christians live in fear of being accused of “blasphemy” and either tortured and killed by a raging Muslim mob or arrested and imprisoned by a thoroughly Islamized law enforcement apparatus; or Hamas-ruled Gaza, which encourages a culture of rage and hatred toward Israel and glorifies the murderers of Israeli civilians as heroes. Even Egyptian journalists have noted with alarm the looming Islamization of the nation’s media, which would mean the end of the free press. Israel, meanwhile, is taking necessary steps to defend itself from a country that has maintained an imperfect but nonetheless real peace with it for thirty years. 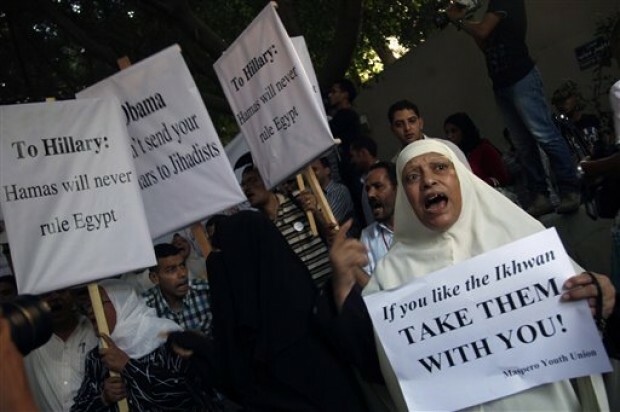 Egypt under the Muslim Brotherhood is virtually certain to be a darker, bloodier, less hospitable place for women, non-Muslims, and anyone who dares to stand for a vision of society other than that dictated by Islamic law. Congresswoman Michele Bachmann (R-MN) is at the center of a firestorm over her request that the State, Homeland Security, Defense and Justice Departments, investigate potential “policies and activities that appear to be the result of influence operations conducted by individuals and organizations associated with the Muslim Brotherhood.” This is an entirely legitimate call, as Bachmann abundantly illustrated in a 16-page letter to Muslim Congressman Keith Ellison (D-MN), laying out the reasons for her concerns. Yet even Senator John McCain (R-AZ), who should know better, has upbraided Bachmann, criticizing her for including Hillary Clinton’s top aide, Huma Abedin, among those she noted for having Brotherhood ties. However, it is odd that McCain would expect Bachmann to produce the outcome of an investigation before any investigation has even taken place. As Bachmann noted, “these questions are raised by the U.S. Government of anyone seeking a security clearance.” So why should Huma Abedin be exempt? Would an official who had family connections with the Ku Klux Klan or the Aryan Nations be similarly exempt from scrutiny? If not, why should someone with familial connections to a group dedicated to “eliminating and destroying Western civilization from within”? After angry Egyptians pelted her motorcade with shoes, chanting "Leave!," Secretary of State Clinton insisted the U.S. wasn't there to take sides. Too late. 'I want to be clear that the United States is not in the business, in Egypt, of choosing winners and losers, even if we could, which of course we cannot," Hillary Clinton intoned earlier this week. Of course, the administration could, and it did, picking and even colluding with the Muslim Brotherhood. And one of its hard-liners, Mohammed Morsi, now sits in the presidential palace, where he refused to shake unveiled Clinton's hand. This administration favored Islamists over secularists and helped them overthrow Hosni Mubarak, the reliable U.S. ally who had outlawed the terrorist Brotherhood and honored the peace pact with Israel for three decades. The Brotherhood, in contrast, has backed Hamas and called for the destruction of Israel. Now the administration is dealing with the consequences of its misguided king-making. Officials fear the new regime could invite al-Qaida, now run by an Egyptian exile, back into Egypt and open up a front with Israel along the Sinai. Result: more terrorists and higher gas prices. In fact, it was Hillary's own department that helped train Brotherhood leaders for the Egyptian elections. Behind the scenes, she and the White House made a calculated decision, and took step-by-step actions, to effectively sell out Israel and U.S. interests in the Mideast to the Islamists. 2009: The Brotherhood's spiritual leader — Sheikh Yusuf Qaradawi — writes an open letter to Obama arguing terrorism is a direct response to U.S. foreign policy. 2009: Obama travels to Cairo to deliver apologetic speech to Muslims, and infuriates the Mubarak regime by inviting banned Brotherhood leaders to attend. Obama deliberately snubs Mubarak, who was neither present nor mentioned. He also snubs Israel during the Mideast trip. 2009: Obama appoints a Brotherhood-tied Islamist — Rashad Hussain — as U.S. envoy to the Organization of the Islamic Conference, which supports the Brotherhood. 2010: State Department lifts visa ban on Tariq Ramadan, suspected terrorist and Egyptian-born grandson of Brotherhood founder Hassan al-Banna. 2010: Hussain meets with Ramadan at American-sponsored conference attended by U.S. and Brotherhood officials. 2010: Hussain meets with the Brotherhood's grand mufti in Egypt. 2010: Obama meets one-on-one with Egypt's foreign minister, Ahmed Aboul Gheit, who later remarks on Nile TV: "The American president told me in confidence that he is a Muslim." 2010: The Brotherhood's supreme guide calls for jihad against the U.S.
2011: Qaradawi calls for "days of rage" against Mubarak and other pro-Western regimes throughout Mideast. 2011: Riots erupt in Cairo's Tahrir Square. Crowds organized by the Brotherhood demand Mubarak's ouster, storm buildings. 2011: White House sends intelligence czar James Clapper to Capitol Hill to whitewash the Brotherhood's extremism. Clapper testifies the group is moderate, "largely secular." 2011: Qaradawi, exiled from Egypt for 30 years, is given a hero's welcome in Tahrir Square, where he raises the banner of jihad. 2011: Through his State Department office, William Taylor — Clinton's special coordinator for Middle East transitions and a longtime associate of Brotherhood apologists —gives Brotherhood and other Egyptian Islamists special training to prepare for the post-Mubarak elections. 2011: The Brotherhood wins control of Egyptian parliament, vows to tear up Egypt's 30-year peace treaty with Israel and reestablishes ties with Hamas, Hezbollah. 2011: Obama gives Mideast speech demanding Israel relinquish land to Palestinians, while still refusing to visit Israel. 2011: Justice Department pulls plug on further prosecution of U.S.-based Brotherhood front groups identified as collaborators in conspiracy to funnel millions to Hamas. 2011: In a shocking first, the State Department formalizes ties with Egypt's Brotherhood, letting diplomats deal directly with Brotherhood party officials in Cairo. April 2012: The administration quietly releases $1.5 billion in foreign aid to the new Egyptian regime. June 2012: Morsi wins presidency amid widespread reports of electoral fraud and voter intimidation by gun-toting Brotherhood thugs — including blockades of entire streets to prevent Christians from going to the polls. The Obama administration turns a blind eye, recognizes Morsi as victor. June 2012: In a victory speech, Morsi vows to instate Shariah law, turning Egypt into an Islamic theocracy, and also promises to free jailed terrorists. He also demands Obama free World Trade Center terrorist and Brotherhood leader Omar Abdel-Rahman, a.k.a. the Blind Sheik, from U.S. prison. June 2012: State grants visa to banned Egyptian terrorist who joins a delegation of Brotherhood officials from Egypt. They're all invited to the White House to meet with Obama's deputy national security adviser, who listens to their demands for the release of the Blind Sheik. July 2012: Obama invites Morsi to visit the White House this September. The Muslim Brotherhood's sudden ascendancy in the Mideast didn't happen organically. It was helped along by a U.S. president sympathetic to its interests over those of Israel and his own country.